Something isn’t quite right here. At first glance this might seem like a picture of a frozen river at the bottom of a canyon, but then you might notice the trees lining the rim on the left side of the picture. If it were a river those trees would be a lot smaller, which stands to reason since the withered branches and grasses on the right side would need to be much smaller too. 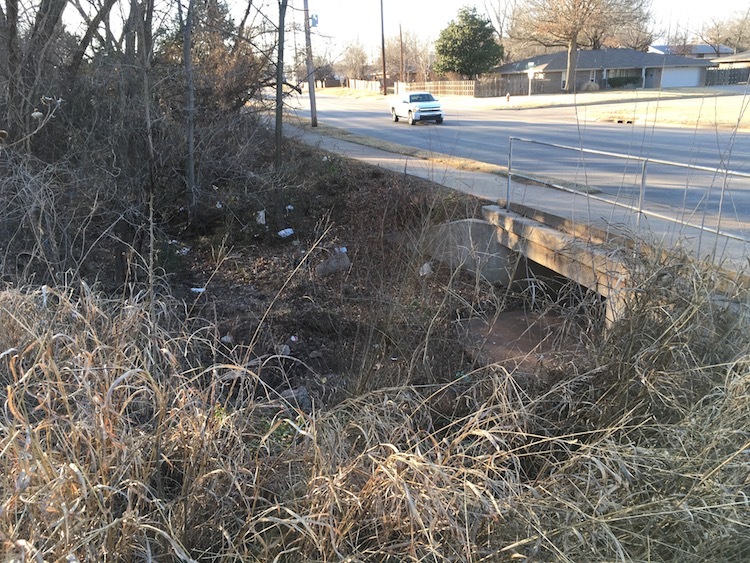 You might also, upon further inspection, notice the prominence of trash in the picture–wrappers, bags, cardboard, and other sundry items that show evidence of a much more mundane and, I might say, boring scene. Weird how much of a difference there is, isn’t it? What’s actually just a lowly ditch becomes something else entirely when photographed at the right time, from the right angle, with the right exposure settings, and even when it’s processed in such a way so as to highlight different things based on what the photographer intended. And for me, all this just goes to show that you can take something entirely ordinary and make an interesting photo with a little creativity. As I often do I initially disregarded the very idea of taking a picture at this location because I literally go past it almost every single day either in my car or on my bike. It’s just not interesting at all, and yet, when I saw the frozen water I thought I could maybe, possibly, hopefully get a picture that was worth looking at. The sun was just starting to come up so I didn’t have much light to work with, but I set my aperture to f/1.8 and let my camera calculate a shutter of 1/90 and ISO of 2500, which almost made the whole scene feel like it’s in mid-afternoon. 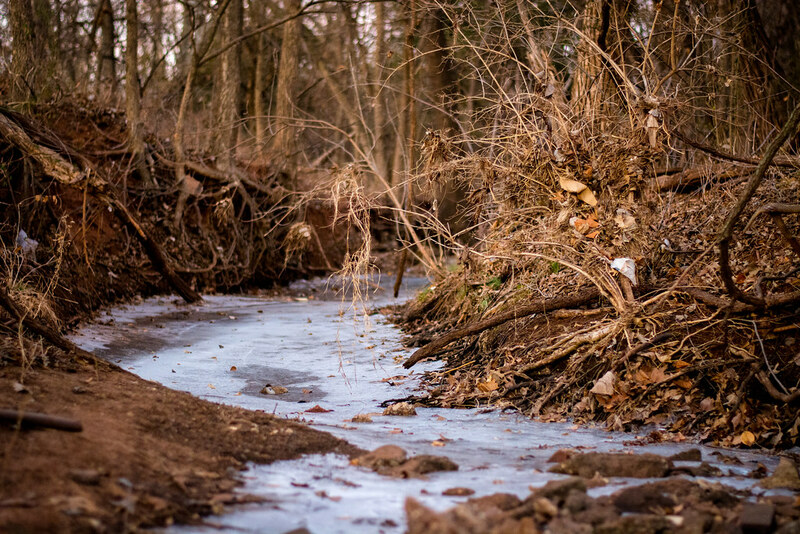 I shot a couple images at smaller apertures but I liked the depth of field at f/1.8 and I think it lends the scene a bit more of a majestic feel than it otherwise might have–if majestic is even a word that can be applied to a tiny frozen runoff stream. I also removed a couple bits of garbage in Lightroom just because…well, because it’s my picture and I can do what I want :) I thought they detracted from the rest of the image, though what I really should have done is actually remove them when I was taking the picture. It would have made for a more pleasing image and helped clean things up a bit too. Hmm. Now I think I’m going to do just that the next time I bike past here. I think you forgot the second image. Images to photograph can be found almost anywhere, if we just open our eyes and minds to the possibilities. Nice job Simon.